After morethan four months on the arctic plains of the red planet, NASA's Phoenix MarsLander's days are finally numbered.As the sun begins to set for the frigidMartian winter, the spacecraft will lose its energy supply, freeze andeventually fall into a mechanical coma from which it will likely never wake up. 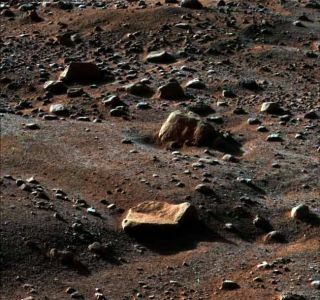 Phoenix's mission has been to dig upsamples of Martian dirt and the subsurface layer of rock-hard water ice at itslanding site in Mars' Vastitas Borealis plains. The lander has been scanningthe samples for signs of the region?s past potentialfor habitability. Phoenix landedon Mars on May 25, late spring in the Martian northern hemisphere. Themission was originally slated to last three months, to the end of August, butwas extended twice; first to the end of September and recently through the endof December. But whetheror not Phoenix will survive that long is uncertain and depends on how thespacecraft's systems handle its ever-dwindling energy supply and the harshconditions of the Martian winter. "We'reat the mercy of Mars," said Phoenix project manger Barry Goldstein, ofNASA's Jet Propulsion Laboratory in Pasadena, Calif.
As winterdescends on the Martian arctic, two important things will happen: The sun willsink below the horizon, and "it's going to get cold," said Phoenixmeteorological team member Peter Taylor of York University in Toronto, Canada. Of course,Mars is never warm by Earth standards (it is further from the sun and lacks ourplanet's thick, heat-trappingatmosphere), but summer above the Martian arctic circle is downright balmycompared to the winter. Middaytemperatures at Phoenix's landing site hit about -4 degrees Fahrenheit (-20degrees Celsius) in the summer (as measured by the lander's meteorological mastthermometer). Nighttime temperatures then still dropped to -112 F (-80 C).Currently, those daytime temperatures have started dipping down to -22 F (-30C), with nighttime temperatures hitting about -130 F (-90 C). Bymid-November, those night temperatures are expected to plummet to -184 F (-120C). The reasonof course, is that setting sun. The sun isconstantly above the horizon during the arctic summer, just as it is on Earth.Come fall, it starts to dip below the horizon more and more each day untilwinter, when it sets for good and doesn?t rise again until the spring. The sun hasalreadybegun to sink below the horizon for part of the day at Phoenix's location,Goldstein said. Phoenix's landing site is at a latitude similar to northern Alaska on Earth. The coldertemperatures and setting sun combined will diminish the energy available to Phoenix for its science operations. During thesummer, there is plenty of sunlight hitting Phoenix's wing-like solar arrays,its sole source of power on the planet. But once the sun is gone, so is itsenergy supply. "Thesun is going down, so there's less and less energy being fed into the batteriesthrough the solar panels, and that really is the biggest problem" facingthe mission, Taylor said. Specifically,the orientation of Phoenix's solar arrays limits how much sunlight it can takein as the sun changes its position in the sky. "Theproblem is that the solar panels are horizontal, and we can't tilt them, so asthe sun gets lower and lower on the horizon, there's less and less power beinggenerated," Taylor explained. At thebeginning of the mission, Goldstein said, Phoenix's solar arrays were generatingabout 3300 Watt-hours per sol, or Martian day (about 24 hours, 39 minutes) ?that's enough energy to light a 60-Watt light bulb for 55 hours. On Sept.13, or 109th sol since landing, energy generation had already dipped down to 2400Watt-hours per sol. "Andwe're steadily decreasing," Goldstein said. The energycut-off point for the lander will come around the time the arrays can onlygenerate about 1000 Watt-hours, which is "the absolute minimum amount ofenergy that it takes for the spacecraft to wake up in the morning,"Goldstein told SPACE.com. "Notsurprisingly, we kind of hit that number at about the middle to end ofNovember" according to model projections, Goldstein added. Those modelsare somewhat conservative in their estimates he said, so it's possible thelander could hold on for a few extra days, "but it's not going to bemuch," he said. Mission leaders are planning to have alltheir science operations, such as gatheringand analyzing samples, completed by that cut-off date. Mission scientists had planned to gatherall the remaining samples (for the one unused cell in the wet chemistry lab andthe four unused ovens in the Thermal and Evolved-Gas Analyzer, both of whichanalyze the composition of samples) by the end of September. Since that didn'thappen, they are now aiming to complete sample gathering by mid-October. "Sothe sooner we get as many of the samples into the cells, the better,"Goldstein said. After October,the lander will essentially transition into a weather station, observing the transitioninto winter for as long as it can hold on. "We'llkeep measuring temperatures and pressures as long as we can," Taylor said. If possible the team will also try to use the lander's lidar to takemeasurements of the clouds that have been gathering overhead as theatmosphere has cooled and its camera to take images of the frost that hasalready started forming on the ground. The frostthat has already begun to accumulate in the area around Phoenix's landing site,as well as the sheer cold temperatures will also affect the lander, thoughtheir impact will mostly come after Phoenix ceases operations. Imagestaken recently with the lander's Surface Stereo Imager have shown pockets offrost forming on the ground, especially in the trenches that Phoenix hasbeen digging, Taylor said. So far, thefrost hasn't formed on the lander ? except for on the small mirror used to viewthe wind telltale at the top of the meteorological mast ? because Phoenix stayswarmer than the ground around it. "Ingeneral the lander itself is designed to absorb as much solar radiation as itcan, and to emit relatively little radiation in the infrared. So the landerdeck has been much hotter than the surrounding ground surface, forinstance," Taylor explained. "It's a bit like the top of a relativelywarm computer, if you like." The landerwill likely stay warmer than its surroundings for awhile after Phoenix losesthe energy it needs to operate, "so it'll be pretty late on when frostactually starts to form on the lander," Taylor said. So Phoenix isn'tlikely to get any pictures of itself coated in frost. Right nowthe frost that is forming is all water ice because it is not yet cold enough at Phoenix's latitude for carbon dioxide ice to form, though it eventually will.Whether the frost will come as a thin coating or a thick sheet, like Mars'polar ice caps, isn't known. "We'renot sure how much CO2 will deposit at this latitude ? most of it is on thepolar cap," Taylor said. Taylor tends to think the frost won'tbuild up as much as at higher latitudes. "We'll see little flakes of ice,we'll see ice crystals and frost, but it won't be [like] the ice that freezeson your windscreen on a winter's morning," he said. After Phoenix shuts down, the only way to observe the mounting frost will be through NASA?s MarsReconnaissance Orbiter's High Resolution Imaging Science Experiment (HiRISE)camera. Scientists aren't sure just how much HiRISE will be able to see, butthe team is hoping it will be able to shed some light on Phoenix fate, sincecommunication with the lander will be lost. "Wewon't be able to talk, but we'd sure like to watch," Goldstein said. The bigquestion will be what happens when Phoenixemerges on the other side of winter: Can it live up to its name and come backto life when spring brings back the sun? Not likely,Goldstein and Taylor said. Phoenixdoes have a built in reboot program that its designers call a "Lazarusmode," "where when energy comes back into the vehicle from the solararrays ? if and when energy comes ? it'll automatically try to reboot and tryto communicate," Goldstein explained. But he doubts that will happen. "Iwould be overjoyed to hear something come back from Phoenix; I'm extremely ? Ifind it very, very unlikely," Goldstein said. The reasonGoldstein, and others on the Phoenix team, think it unlikely that Phoenix will make a comeback is simple: The lander has entered conditions on the surfacebeyond what it was built and tested to withstand. "Wepassed the warranty a long time ago," Goldstein said. But evenwithout being entombed in carbon dioxide ice, Phoenix likely won't survive theharsh winter because even in the summer, the lander needs heaters to keep itselectronics warm enough to function. Phoenix's circuit boards and wiring aregenerally regulated to about -40 degrees Fahrenheit (-40 degrees Celsius) foroptimum performance. "Sowill they survive past that? Yeah they will, but at some point they're going toget so cold that they won't survive," Goldstein said. Mostelectronics can only last down to about -148 or -193 F (-100 or -125 C), afterwhich some of the materials that make them up go below their glassificationtemperature. Goldsteinexplains glassification this way: "Think about a rubbery substance or aplastic substance becoming brittle like glass, and once that happens, it startsto crack," Goldstein said. If Phoenix's electronic components crack, it's unlikely the lander will be able to resurrectitself even when sunlight returns to the northern hemisphere in the spring. "Thekind of temperatures we're talking about with no energy to keep the vehiclewarm, it's pretty difficult to imagine," Goldstein said. Come springon Mars (summer on Earth, as theMartian year is longer), when sunlight has been streaming down long enough topotentially re-awaken the spacecraft, NASA will likely listen for any beepscoming from Phoenix, though Goldstein doesn't think they'll hear anything. Soonce Phoenix dips below its energy threshold around the end of November, thatwill likely be all she wrote for the mission. "It'sa fun project but we're getting near the end," Goldstein said. ImageGallery - Phoenix on Mars!